There’s a strange belief that every new entry in an ongoing series must bring something entirely new and different to the table. While change can undoubtedly be refreshing, sometimes it’s perfectly acceptable to stick to a proven formula, because proven formulas work. Insidious: Chapter 3, the latest film in the beloved and highly-successful horror series, brings nothing new to the table, and that’s exactly why it works so well. 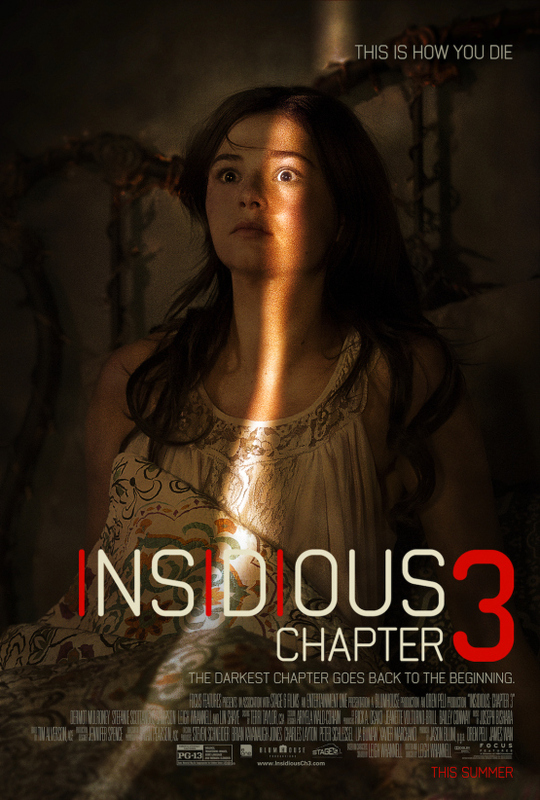 The directorial debut of screenwriter/actor Leigh Whannell, Insidious: Chapter 3 begins a few years before the events of the first film. The story focuses on Quinn Brenner (Stefanie Scott) an aspiring actress with high hopes for the future. Since her mother’s death, Quinn’s father, Sean (Dermot Mulroney) has struggled to be a good father to his children, despite his best attempts. With her future uncertain, and her family in peril, Quinn decides to reach out to Elise (Lin Shaye), a rumored psychic, in hopes of reaching her mother. As fans of the series already know, calling out to the dead isn’t exactly safe, and it isn’t long before a demonic being tries to latch onto Quinn, prompting some familiar faces to help take action. Angus Sampson and Whannell return as Tucker and Specs, and the film documents the goofball origins of the Spectral Sightings team. For the third time, the duo provides some much-needed comic relief, and are as funny and charming as ever. Lin Shaye is nothing short of phenomenal in the lead role, and Whannell’s screenplay really allows her to shine. Elise’s transformation from a meek, middle-aged women to a powerful, demon-fighting machine provides more than a few raucous moments. There were a couple of instances in particular when my theater felt the urge to loudly cheer on the psychic hero with booming applause.Insidious: Chapter 3 is that kind of movie. It’s complete fan service with numerous in-jokes, callbacks, and one of the greatest cameos of all time. Tonally, the latest entry in the series is quite similar to the second, mixing boatloads of effective jump-scares with some eeriness and moments of levity. While not nearly as tense and suspenseful as the original Insidious, the film does feature one of the best scares in years. If you claim it didn’t get you—we all know you’re lying. With plenty of horrific-looking ghouls and some solid special effects, the film delivers the brand of spookiness you should come to expect.